It's hard to imagine a pizza without mozzarella. This wonderful traditional Italian cheese is now made all over the world. It has a fairly short shelf-life and really is best consumed when it's fresh. And you can't get fresher than home-made. Fill the pan you'll be making your cheese in to within a couple of inches of the top with water. Bring it to the boil and add your equipment - this should include a straining spoon, a palette knife, a ladle, a tablespoon, a teaspoon, measuring spoons and cups and some muslin cloth. It's best if your implements are stainless steel. If you're using a digital thermometer, clean the probe part with IPA (isopropyl alcohol). Boil them for 10 minutes, then remove them and keep them on some kitchen paper. Dissolve the citric acid in 250ml (half a cup) of water. Pour the milk into a large pot, add the citric acid and stir well. Gently heat the milk until it reaches 32°C (90°F), then remove it from the heat. While the milk is heating, dissolve the ¼ rennet tablet in 60ml (quarter cup) of water. When the milk is off the heat, add the rennet solution, stir for 30 seconds, put a lid on the pot and leave it undisturbed for 5-10 minutes. The curds should have formed. Now test it for a clean break by cutting it down the middle with your palette knife. 'Clean break' means the curds stay separate when cut, rather than running back together. Cut the curds into a grid pattern, making sure your knife goes all the way to the bottom of the pot. Make some diagonal cuts too to try to break the curds into 'cubes'. Heat the curds and whey to 41°C (106°F), stirring slowly. Remove from the heat and stir slowly for another 5 minutes. Line a colander with muslin cloth, scoop the curds into it and let it drip for 5 minutes. Place the curd into a bowl of water at 70°C (158°F) and salt to taste. Wait a minute or two until the curd looks like melted cheese. Grab a handful and hold it by the top edge - the rest of it should stretch away. Stretch it in different directions - the cheese should be smooth and shiny. You may need to add more hot water to the bowl if the cheese becomes hard to work. To shape the mozzarella, stretch it from two edges, fold them under, rotate the cheese 90 degrees, stretch and fold under. Pat it into a ball shape and grip the bottom between your thumb and forefinger. Then squeeze thumb and finger together to pinch the excess off. Immediately place the mozzarella balls into a bowl of iced water to cool down for at least 15 minutes. The video above is from the Keef Cooks YouTube channel. 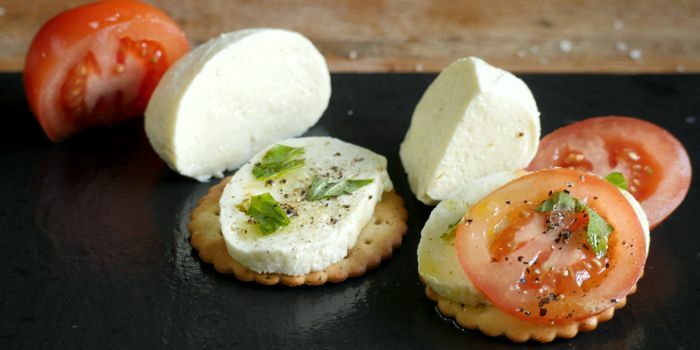 Click here to see the video recipe of Homemade Mozzarella on YouTube. A note about milk: ultra-pasteurised (UHT) milk will not work. Ideally, you would use raw, unpasteurised milk, but this is very hard to obtain. I use non-homogenised milk, and that works fine. Prep time: 10 minutes. Cooling time: 10 minutes.